The Latt' e Liett' is a window on the gulf in the center of Naples just 20 meters from Maschio Angioino Castle (Castel Nuovo) and from Piazza del Plebiscito, also just a few steps from historical part where you will find the most important monuments. Because of its central position, it is the ideal spot for those who like walking around the best and safe areas of the city, but it is also near all forms of public transportation. Right in front us there is the Port with ferries to: Capri, Ischia, Procida, Sorrento, Sicily, Sardinia, Tunisia and Eolie Islands. 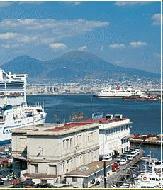 Only 2 minutes by walk to the "SITA" Bus station to: Vesuvio, Pompei, Ercolano, Sorrento, Positano and Amalfi coast. Latt' e Liett' has an enchanting and warm atmosphere with 3 mini-apartments, recently refurbished, that have a small terrace with sea-view (just 1 without) and independent access. Enjoy the freedom & flexibility of indipendent self catering in the best city centre location. When we say city centre we mean it! 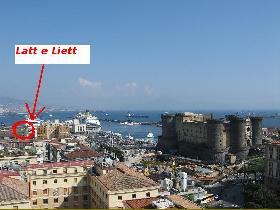 Latt' e Liett' is where comfort and kindness meet value for money in Napoli!